There are endless aspects to opening a new location that you have to take into consideration. You need to secure a lease, buy the right furniture and equipment, and you will probably have to remodel the venue. You also need to make sure you have signage in place as soon as possible to create interest in your business. Bésame realized this, so they contacted The Sign Studio for signs and graphics for retail stores in Whittier, CA. After a life-long love affair with vintage beauty, Gabriela Hernandez, a cosmetic historian, designer, and artist, created Bésame Cosmetics in 2004 in Burbank. She founded the vintage makeup brand to honor the spirit, sensibility, and style of female beauty. It is their goal to show the world the strength, femininity, and elegance of women. They have products for the face, eyes, and lips as well as fragrances available at two brick-and-mortar shops or online. When a business that does so much to help women look their best came to us for signs and graphics for boutiques in Whittier, CA, we were more than happy to help. 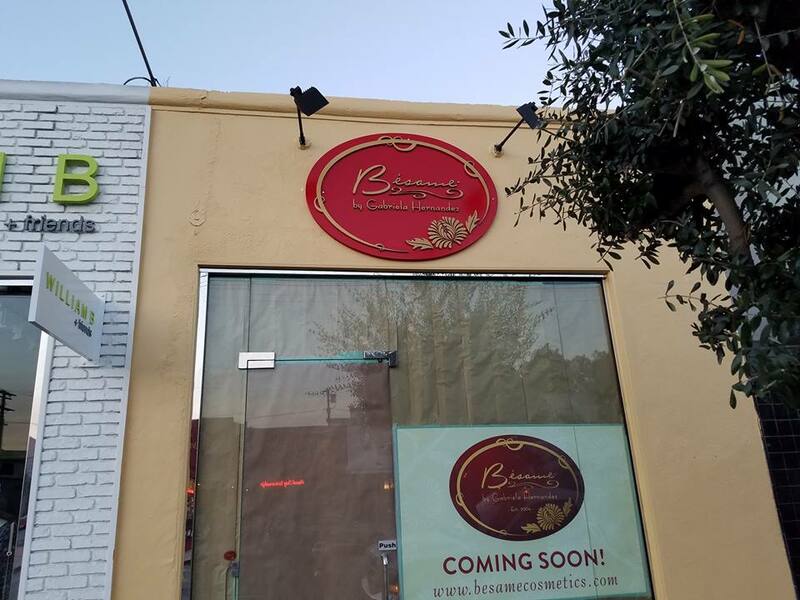 Bésame is in the process of opening up a second location on Greenleaf Ave in Whittier, and they needed some signage to get a buzz going. We knew just want to do. The first step in any of our signage projects is to meet with the client and discuss their goals and vision for their project. At this time, we also performed a site survey. Based on their budget and the neighborhood, we suggested a panel sign and banner. They liked these ideas, and once they approved of the art proofs we provided them with, we got down to work. For the panel sign, we started with a durable aluminum composite panel that was painted red to match Bésame’s branding. We then added intricately cut dimensional lettering that precisely matches the details of their logo. These dimensional elements were then painted to match the logo’s colors. The banner is made of vinyl. We digitally printed the logo, the client’s website, and “Coming Soon!” directly to the banner. Once the markers were ready, we worked with the client’s schedule to install them at a time that was convenient for them. As you can see, they are still remodeling their new location, and the banner helps to block the view of snooping passersby. In the end, Bésame was completely satisfied with the work we did. Let Us Help You Prepare for Your Grand Opening! Whether you are changing locations, opening up a second shop, or you are starting your first brick-and-mortar business, we can take care of your signage needs for you. The moment the ink dries on your lease, you should pick up the phone and contact The Sign Studio. Based on your budget and goals, we will make recommendations that will make opening your new location go as smoothly as possible. For more information, contact our friendly professionals today for a free consultation.